Attire during sessions: ¾ pants/jeans or long pants/jeans, shirt or t-shirts for both gender. Spaghetti straps, short skirts, sleeveless & tight-fitting clothes are not allowed for girls. Showing of midriff is strictly prohibited. Proper attire for the purpose of games is allowed but must be decent. Sleeveless t-shirts are not allowed for boys during sessions. Showing of underwear is strictly prohibited. Proper attire for the purpose of games is allowed but must be decent. Boy-Girl relationships or the appearance of exclusive relationship are not allowed. JS students are not to be allowed any visitors without prior permission from the Director of the School. Handphones are not allowed to be used during weekdays. However, the students will be allowed to use them during the weekends. Students are expected to wash, dry and iron their own clothes. Laundry services are not provided. All card games & computer games are not allowed in JS. Internet services are not provided. No opposite gender visits to the dorm allowed. Going out to town is not allowed without the prior permission of the School’s Director. Journaling must be completed and submitted to the respective mentors weekly. Punctuality is a must for all sessions. Lights-out is to be strictly observed. Jeremiah School (JS) has been running since 2003 and we are really amazed at how God worked in the hearts of all those who came. We thank God for the TRAC leaders who conceived this dream and realize it by starting this school. We continue to bring a holistic awareness of God’s ministry to the youths who come for this school. The calling and challenge of the Christian Vocation remains the heart beat of Jeremiah School. With this in mind, the syllabus was developed to challenge the students in their walk with God. The areas include Spiritual Formation, Doctrinal Studies, Bible Studies and Theology, Personal Development, Ministry Skills and Practical Ministry. Their practical skills are put to test during mission week where they will go and share God’s word with strangers. They will also plan an evangelistic program during this time. It is indeed hard work for them and we can see how they have grown in the Lord and also in relation with one another by taking ownership of the program. 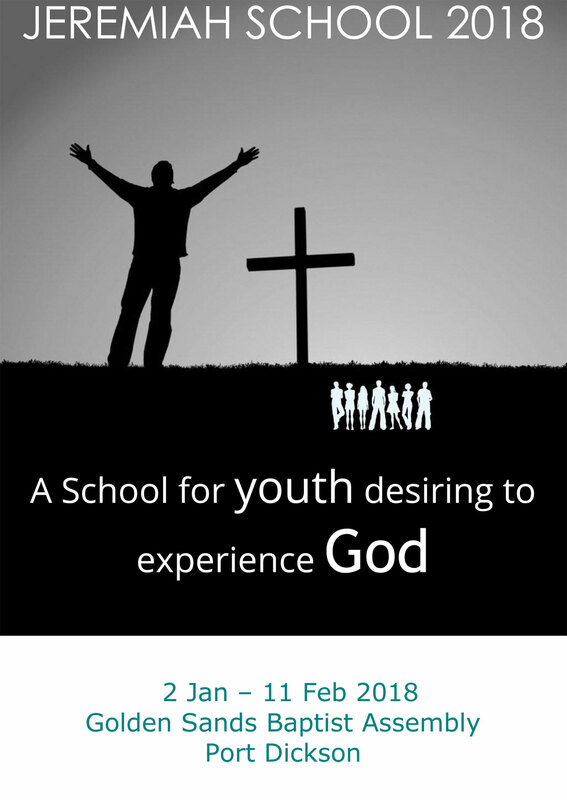 Jeremiah School is a place for youths who are serious about God and living out their faith in the world. They have to have a desire to learn, develop, grow and be transformed in the Lord. We hope that they will be a generation of God-fearing, faithful, persevering and selfless young leaders who will be of a different spirit. It is amazing every year that God sends in the right number of students and mentors for these 6 weeks. We had JS alumnis coming in to be a mentor to the students. We praise God for their dedication and commitment. For students, kindly express your desire to your Youth Counselor for further action and go through the proper interviews with your church. For parents, kindly approach your youth counselors and Pastor and check with them if your children are eligible. For Youth Counselors/Pastors, kindly pray and identify the youths who’d benefit the most from JS. Encourage them to attend JS. All applications will be processed & successful applicants will be notified by 15th December 2017. Jeremiah School is staffed by officials from the TRAC Board of Youth Work. They oversee the running of the school, the development of curriculum and are actively involved in intentional mentoring of the JS students throughout the school term. Ever since JS started in 2003, we have found that some of the best learning and growing happens when mentoring takes place. In view of this, we need more adult volunteers to wear the shoes of a mentor and walk alongside the students. If you love youths and are available for 6 weeks, we’d like to encourage you to prayerfully consider this opportunity to serve. Friendly and willing to sacrifice time. Successful Applicants will be required to attend Mentor Training. The training will cover the objectives and introduction to the teaching modules of the school. Mentors will be required to read ‘Mentoring’ by Tim Elmore. Mentors will be equipped with the Youth version of ‘Freedom In Christ’ sessions. Mentors will be trained in the Development Tracking Record of the students assigned to them. Mentors will also undergo a teaching segment on how to build relationships with youth. As part of the ongoing mentoring development, mentors will be assessed and will be given more coaching skills as and when needed. Kindly submit your application to be a mentor to supplanter05@gmail.com or uncleherbie@gmail.com before 30th November 2018. Potential applicants will be interviewed by JS staff. Successful applicants will then be notified.